With the new 360, Vuly has created the strongest and safest outdoor play set in the world – from the stable frame to the long-lasting swings. For families who always put safety first for their children, and for kids who want the ultimate in fun, 360’s premium design is built to last and made to offer a unique play experience. In our previous article, we introduced the new Vuly 360 play set’s amazing Spin and Yoga Swings. This time, we look at the strength of 360’s elegant design compared to that of the competition. 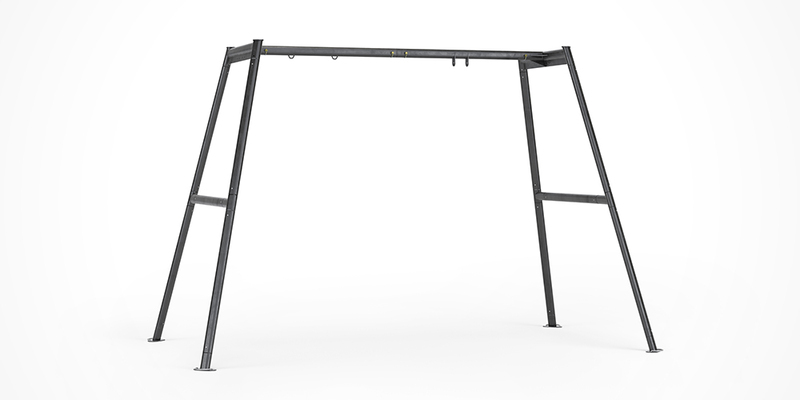 Combined with the array of upcoming swing options and addons, the sophisticated 360 frame will provide the foundation of years of fun for the whole family. Upgrade and refine it as your tastes change; 360 allows you to create and recreate your own fun again and again. Like Vuly’s premier trampolines, 360 will outlast any other play set on the market. While many play sets are made from a combination of thin metal and plastic, Vuly has cut no corners to ensure that 360 can stand up to the harsh Australian climate and provide fun beyond a birthday or Christmas. Compared to the frame components on other sets, 360’s 70mm width and 2mm thickness is two-times as thick and 40% wider! Vuly also incorporates the comprehensive frame treatment process from its top trampolines; 360 can to shrug off the decay that would claim inferior play sets. This rust and weather protection consists of heat treatment, twice galvanisation on the inside and outside of its tubing and a black, matte powder-coating. Side-by-side with the components of any other set, the quality of 360 is clear. When you open your two 360 play set packages, you’ll find logical instructions on how to completely click together the frame. Each part is clearly laid out, and Vuly’s new push-button system clicks together more securely. You’ll always know when you’ve safely connected each frame component, and you can forget searching for missing nuts and bolts in the grass! When you want to swap out a compatible swing – like a Yoga for a Classic – simply unhook it from the overhead bar and attach the new one! Vuly has carefully designed 360’s tall A-frame for maximum stability while users are swinging. When fixed to the ground with the included anchors, 360 is suitable for more than a single user – at a combined user weight of 80 kg. That’s a significantly higher weight rating than competing outdoor play sets. Have you had trouble with swing sets in the past – with their short used-by dates and poor reliability? See more about Vuly 360!